was worth their death by fire. had the right to work. Very much a draft poem for Grace’s prompt on With Real Toads to write something in the style of Marilyn Chin. This was influenced by a series of one-line haikus she wrote–each of the above 17 syllables. Process note, especially for those outside the U.S.: Scott Walker is a GOP (Republican) candidate for President of the U.S. His claim to fame as Governor of Wisconsin is breaking down unions and attacking the University of Wisconsin, through budget cuts,targeted attacks on professors (especially it seems those with an environmental outlook) and attacks on the institution of tenure (though this is actually enshrined in the Wisconsin State constitution.) He is supposedly the chosen candidate of the Koch Brothers, oil billionaires, who plan to spend hundreds of millions in upcoming elections. The Triangle Shirtwaist Factory Fire in 1911 was a factory fire in New York City which 123 women garment workers and 23 men died largely because they were locked into their factory floors. Poultry farming is a big business in the U.S., with actual farmers under the thumb of big corporate chicken producers. An interesting clip on this subject by Jon Oliver may be found here. Composite pic is mine–all rights reserved; no copyright infringement intended in underlying pic. This entry was posted on June 14, 2015 at 7:09 pm and is filed under news, poetry, Uncategorized. You can subscribe via RSS 2.0 feed to this post's comments. This is devastating to read… I wonder how they get people to vote against their own good… I think these one line sentences work very well, and got me thinking about Ginsberg as well. Remind you of the way that workers were treated once in our country, and surely those in power (wealth) would love it to be again – can they buy an election. Surely. If enough of us let them. I am a huge fan of any form of protest poetry, especially when written by someone with an active social conscience. The bitterness of tone serves to highlight the very real threat that we all face the world over when money and big business stir the pot of politics. You really hit every nail on the head here, k. The creation of a serf class is well into its roll, and Walker is the man who’s been picked to pilot that ship for the ‘captains of industry’ who have bought our country. If anything, we are not outspoken or bitter enough about the rights we are steadily losing, drip by drip. Thanks for exploring this form, and doing such a great job with it.And for speaking out. If I’d known where the piece was going, I would have tried to make it sharper, but you know how these things go–then I thought–well, better to say something! 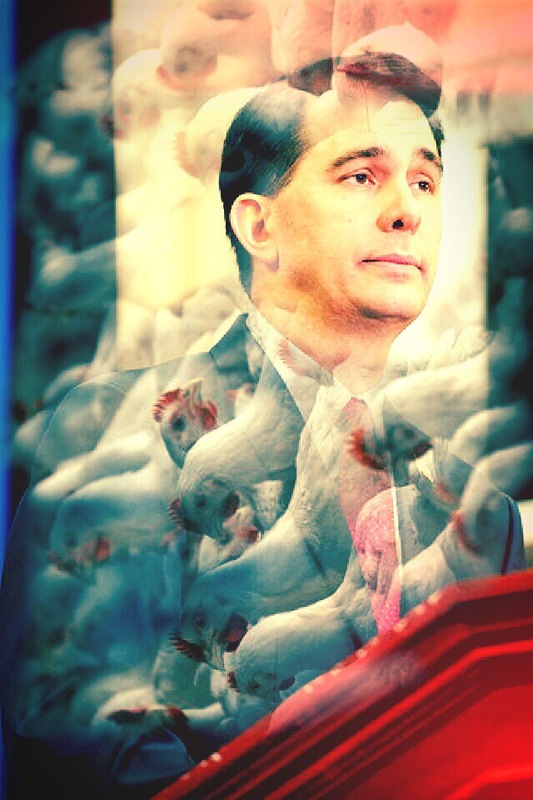 I so dislike Walker–he either intellectually dishonest, or just vacant. I will give him the credit of being smart enough to be intellectually dishonest. I’m impressed. I don’t think that I could bear to think about Scott Walker through the writing of 11 haiku. What does it say about a political party when Walker is one of the saner, more moderate options? And, I should have known you were a fellow Jon Oliver fan! Ha. I don’t know that he is so moderate though! I don’t have a TV and so don’t see Oliver as much as I’d like too–when I think of it–but he is so good, and I’ve actually run into him on the street in NYC two times! He was very gracious both times. (I told him I was a fan!) k.
The delivery of each thought in these set apart yet connected lines is very powerful, K.
Outstanding commentary in these lines. Nicely done! The way you played with “smoke” and “fire” in the first line was unbelievable. From then on the poem just got better. I have read about this guy. Thanks, great poem. Hey Michael, I pardon your French. Thanks. K.